The name “Samaritans” is translated in Hebrew as “Shamerim”, i.e. in Arabic the people of Shamer. There is conflict over the etymology of the name for the Samaritans between Jews and Hebrew about the source and meaning of this name, which was given to the group of Hebrews who refuse to describe themselves as Jews (similar to the stand of the Ethiopian Beta Israel in today’s State of Israel). They affirm that the Jews are foreigners and infidels and are not of the Israelites. And this calls for the possibility of linking between the Samaritans i.e. 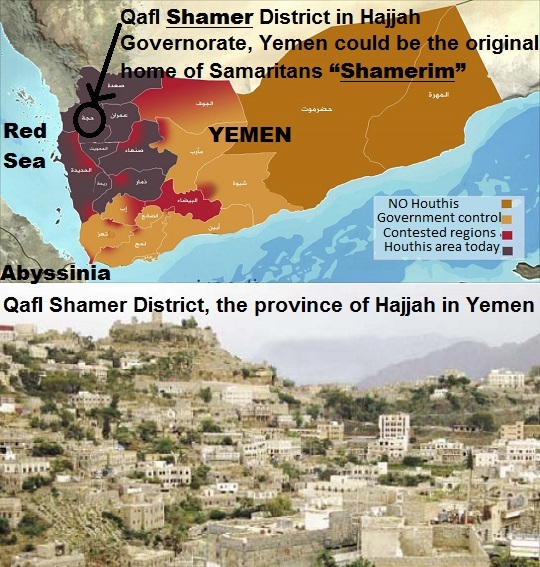 “Shamerim” and inhabitants of Qafl Shamer District, which is one of the districts of the province of Hajjah in Yemen. And it is in the Houthis area today. If this possibility is true, this will strengthen the hypothesis affirming Yemeni origin of the Israelites and their being originally a Yemeni Arab tribe. (The Samaritans are Israelis with very strong Arab culture until today). Firstly, Titus Flavius Josephus born Yosef ben Matityahu (38-100 AD) was a first-century Romano-Jewish scholar, historian and hagiographer, who was born in Jerusalem—then part of Roman Judea—to a father of priestly descent and a mother who claimed royal ancestry. Fifth, the model of Joseph Ben Matityahu turned into a Roman citizen confirming the extent of the penetration of Turkic Mongolians in the Roman Empire and the role of the Jews in the invention of Catholic Christianity and other doctrines in Europe. Unfortunately there is no videos in English language presenting the Samaritan opinions about themselves, the Arabs, and the Jews. It is all very confusing to Westerners. But, the fact remains that today the peoples of the world urgently need to unite in common interest and resist the JWO (Jewish World Order). No more wars for Israel and for the Jews.